"Liguri" redirects here. For the Eastern Sudanic language, see Logorik language. For the village in Estonia, see Varstu Parish. Peoples of Cisalpine Gaul, 391–192 BC. The Roman Regio IX Liguria. Iron Age groups within the Italian peninsula. 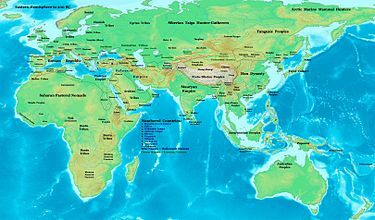 Liguria is located in the upper left corner of the map. Roman Italy, showing Liguria located between the rivers of the Var and Magra. 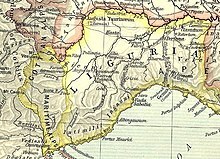 The Ligures (singular Ligus or Ligur; English: Ligurians; Greek: Λίγυες) were an Indo-European people who appear to have originated in, and gave their name to, Liguria, a region of north-western Italy. Elements of the Ligures appear to have migrated to other areas of western Europe, including the Iberian peninsula. Little is known of the Old Ligurian language, the lack of inscriptions does not allow a certain linguistic classification: Pre-Indo-European or an Indo-European language. The problem is closely related to the lack of inscriptions, and to the equally mysterious origin of the ancient Ligurian people. The linguistic hypotheses are mainly based on toponyms and names of persons. Because of the strong Celtic influences on their language and culture, they were known in antiquity as Celto-Ligurians (in Greek Κελτολίγυες Keltolígues). and it is generally believed, after a certain point, that Old Ligurian became an Indo-European language with particularly strong Celtic affinities, as well as similarities to Italic languages. Only some proper names have survived, such as the inflectional suffix -asca or -asco "village". According to Plutarch, the Ligurians called themselves Ambrones, which could indicate a relationship with the Ambrones of northern Europe. Strabo tells that they were of a different race from the Celts (by which he means Gauls), who inhabited the rest of the Alps, though they resembled them in their mode of life. Aeschylus, in a fragment of Prometheus Unbound, represents Hercules as contending with the Ligures on the stony plains, near the mouths of the Rhone, and Herodotus speaks of Ligures inhabiting the country above Massilia (modern Marseilles, founded by the Greeks). Thucydides also speaks of the Ligures having expelled the Sicanians, an Iberian tribe, from the banks of the river Sicanus, in Iberia. The Periplus of Pseudo-Scylax describes the Ligyes (Ligures) as living along the Mediterranean coast from Antion (Antibes) as far as the mouth of the Rhone and then intermingled with the Iberians from the Rhone to Emporion in Spain. The Ligures seem to have been ready to engage as mercenary troops in the service of others. Ligurian auxiliaries are mentioned in the army of the Carthaginian general Hamilcar I in 480 BC. Greek leaders in Sicily continued to recruit Ligurian mercenary forces from the same quarter as late as the time of Agathocles. The Ligures fought long and hard against the Romans, but as a result of these hostilities many were displaced from their homeland and eventually assimilated into Roman culture during the 2nd century BC. Roman sources describe the Ligurians as smaller framed than the Gauls, but physically stronger, more ferocious and fiercer as warriors, hence their reputation as mercenary troops. Once flowed the auburn locks in pride supreme. People with Ligurian names were living south of Placentia, in Italy, as late as 102 AD. Traditional accounts suggested that the Ligures represented the northern branch of an ethno-linguistic layer older than, and very different from, the proto-Italic peoples. It was widely believed that a "Ligurian-Sicanian" culture occupied a wide area of southern Europe, stretching from Liguria to Sicily and Iberia. However, while any such area would be broadly similar to that of the paleo-European "Tyrrhenian culture" hypothesized by later modern scholars, there are no known links between the Tyrrenians and Ligurians. In the 19th century, the origins of the Ligures drew renewed attention from scholars. Amédée Thierry, a French historian, linked them to the Iberians, while Karl Müllenhoff, professor of Germanic antiquities at the Universities of Kiel and Berlin, studying the sources of the Ora maritima by Avienus (a Latin poet who lived in the 4th century AD, but who used as a source for his own work a Phoenician Periplum of the 6th century BC), held that the name 'Ligurians' generically referred to various peoples who lived in Western Europe, including the Celts, but thought the "real Ligurians" were a Pre-Indo-European population. Italian geologist and paleontologist Arturo Issel considered Ligurians to be direct descendants of the Cro-Magnon people that lived throughout Gaul from the Mesolithic period. Dominique-François-Louis Roget, Baron de Belloguet, claimed a "Gallic" origin of the Ligurians. During the Iron Age the spoken language, the main divinities and the workmanship of the artifacts unearthed in the area of Liguria (such as the numerous torcs found) were similar to those of Celtic culture in both style and type. Those in favor of an Indo-European origin included Henri d'Arbois de Jubainville, a 19th-century French historian, who argued in Les Premiers habitants de l'Europe that the Ligurians were the earliest Indo-European speakers of Western Europe. Jubainville's "Celto-Ligurian hypothesis", as it later became known, was significantly expanded in the second edition of his initial study. It inspired a body of contemporary philological research, as well as some archaeological work. The Celto-Ligurian hypothesis became associated with the Funnelbeaker culture and "expanded to cover much of Central Europe". Julius Pokorny adapted the Celto-Ligurian hypothesis into one linking the Ligures to the Illyrians, citing an array of similar evidence from Eastern Europe. Under this theory the "Ligures-Illyrians" became associated with the prehistoric Urnfield peoples. There are others such as Dominique Garcia, who question whether the Ligures can be considered a distinct ethnic group or culture from the surrounding cultures. ^ The suffixes -asca or -asco do not appear to be related to the Celtic -brac, possibly meaning "swamp". ^ a b Boardman, John (1988). The Cambridge ancient history: Persia, Greece and the Western Mediterranean c. 525–479 BC. p. 716. ^ a b William Smith, ed. (1854). "Liguria". Dictionary of Greek and Roman Geography. ^ Shipley, Graham (2008). "The Periplous of Pseudo-Scylax: An Interim Translation". ^ Herodotus 7.165; Diodorus Siculus 11.1. ^ Broadhead, William (2002). Internal migration and the transformation of Republican Italy (PDF) (Ph.D.). University College London. p. 15. ^ Lucan, Pharsalia, I. 496, translated by Edward Ridley (1896). ^ Amédée Thierry, Histoire des Gaulois depuis les temps les plus reculés. ^ Postumius Rufius Festus (qui et) Avienius, Ora maritima, 129–133 (nel quale in modo oscuro indica i Liguri come abitanti a nord delle "isole oestrymniche"; 205 (Liguri a nord della città di Ophiussa nella penisola iberica); 284–285 (il fiume Tartesso nascerebbe dalle "paludi ligustine"). ^ Arturo Issel Liguria geologica e preistorica, Genoa 1892, II volume, pp. 356–357. ^ Dominique François Louis Roget de Belloguet, Ethnogénie gauloise, ou Mémoires critiques sur l'origine et la parenté des Cimmériens, des Cimbres, des Ombres, des Belges, des Ligures et des anciens Celtes. Troisiéme partie. Preuves intellectuelles. Le génie gaulois, Paris 1868. ^ Gilberto Oneto Paesaggio e architettura delle regioni padano-alpine dalle origini alla fine del primo millennio, Priuli e Verlucc, editori 2002, pp. 34–36, 49. ^ See, in particular McEvedy, Colin (1967). The Penguin Atlas of Ancient History by Colin McEvedy. p. 29. ^ Henning, Andersen (2003). Language Contacts in Prehistory: Studies in Stratigraphy. John Benjamins Publishing. pp. 16–17. ^ Garcia, Dominique (2012). From the Pillars of Hercules to the Footsteps of the Argonauts (Colloquia Antiqua). Peeters. ^ Haeussler, Ralph (2013). Becoming Roman? : Diverging Identities and Experiences in Ancient Northwest Italy. Routledge. p. 87. Wikimedia Commons has media related to Ligures. ARSLAN E. A. 2004b, LVI.14 Garlasco, in I Liguri. Un antico popolo europeo tra Alpi e Mediterraneo, Catalogo della Mostra (Genova, 23.10.2004-23.1.2005), Milano-Ginevra, pp. 429–431. ARSLAN E. A. 2004 c.s., Liguri e Galli in Lomellina, in I Liguri. Un antico popolo europeo tra Alpi e Mediterraneo, Saggi Mostra (Genova, 23.10.2004–23.1.2005). Raffaele De Marinis, Giuseppina Spadea (a cura di), Ancora sui Liguri. Un antico popolo europeo tra Alpi e Mediterraneo, De Ferrari editore, Genova 2007 (scheda sul volume). The eastern hemisphere in the 3rd Century BC, prior to the Roman Republic's incorporation of Liguria (upper right).